Glamorgan chief executive Hugh Morris says it was the International Cricket Council who determined the Cardiff pitch used in the Champions Trophy semi-final. 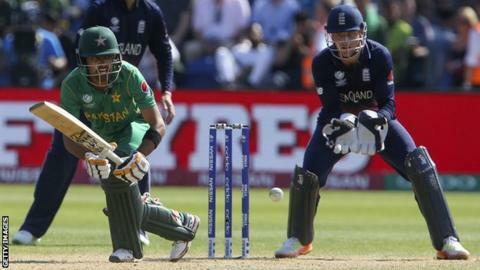 England captain Eoin Morgan says there was no home advantage after his side were thrashed by Pakistan in Cardiff. The hosts were dismissed for 211 on a pitch previously used in group-stage games and lost by eight wickets. "It's a major global event and very much an ICC tournament," said Morris. The same wicket had been used for Pakistan's group game against Sri Lanka 48 hours before. Each venue is only permitted to use three different pitches for the tournament, so an old one was used for the semi-final in Cardiff. The other semi-final between India and Bangladesh at Edgbaston was played on a fresh pitch after the wicket was only used twice during the group games. "We had a number of meetings with the ICC going back to October last year," said Morris. "We had to produce three pitches for the four games and the ICC determine exactly which pitches are played on for what games." Morris believes the Pakistan batsman demonstrated it was a reasonable surface that provided a good battle between bat and ball after reaching their target of 212 with the loss of only two wickets. "We pride ourselves ourselves on trying to produce the best surfaces we can for all the matches we play in Cardiff," said Morris. "The way Pakistan adapted to conditions and knocked off the runs with 13-overs left suggests it was a reasonable surface to play on. "We want to see a good contest between bat and ball so that everyone who watches on the ground and on television enjoys a great game of cricket. "Out of the four games played in Cardiff we saw some excellent cricket throughout the tournament." Morris believes England failed to replicate the form which had seen them win all three group games. "England have played a lot of great cricket over the last 18 months and during this tournament," he said. "Sometimes when you need to perform it simply doesn't work for you. "Unfortunately it was one of those days for England and it's a real shame it happened on a big occasion in front of a full house. "Pakistan will be delighted and have got better after losing to India in their first game." Cardiff crowds during the Champions Trophy had been described as 'pathetic' by former England captain Michael Vaughan on Twitter. Morris said the crowd was a sell-out with a full house turning up as he praised the ICC for redistributing tickets that had been initially bought by Indian fans. "I thought they (ICC) did a really good job," said Morris. "The match had been sold out two months ago and to exchange 3,000 tickets in 24 hours was a pretty significant logistical job for them. "We had a full stadium and we were delighted with that." Glamorgan stage a T20 international between England and South Africa on 25 June before hosting four matches in the 2019 World Cup. In 2018 there will be an England one-day international against Australia and a T20 match against India staged in Cardiff. The county are also hoping Cardiff will be chosen as one of the new eight city-based domestic T20 sides by the England and Wales Cricket Board. for the revamped tournament which starts in 2020.